Spuntino, another ‘tapas’ style small eats restaurant (gosh they are popping up everywhere in London), is the third offering by Russell Norman and Richard Beatty, the people behind the ever-so-popular ‘tapas’ small eat places Polpo and Polpetto. Venture number three has every reason to be as successful as its predecessors. This place, with its New York East Village speakeasy feel simply oozes cool. Its distress-tiled walls, low dangling lights and bar stool seating give it a raw, grungy feel. The frontage is non-descript as well with the restaurant’s name display being barely discernible. From the décor to the staff, this place is so cool it does not take reservations, have a phone number or a menu on their website. As the restaurant doesn’t take reservations, one needs to queue. The layout is similar to Barrafina in the sense that you line up alongside the wall, during which time you can order snacks and drinks. 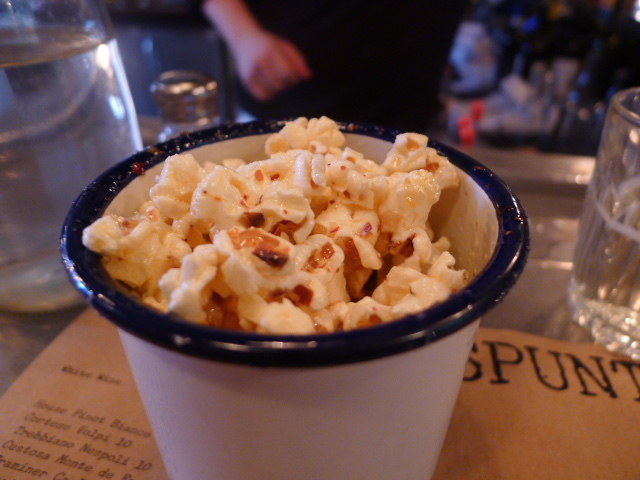 Our meal kicked off with some complimentary spicy popcorn made with chili. These were fantastic if a little greasy. The Italian-inspired tapas menu of small eats is simple and covers spuntinis (small plates for sharing), sliders, plates, salads and desserts. 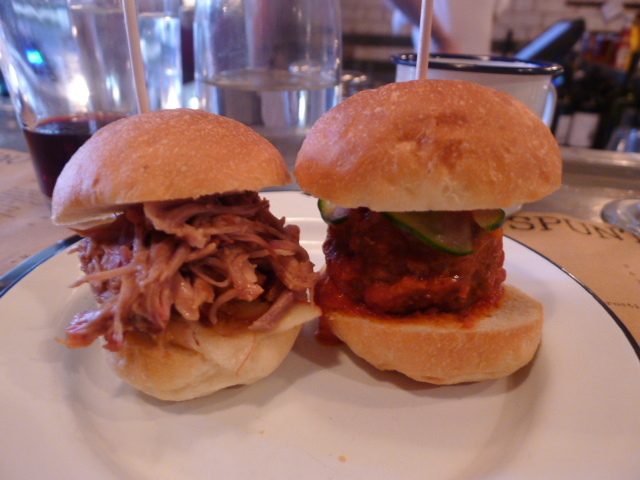 From the sliders we tried the pulled pork and pickled apple (£4.50) and lamb and pickled cucumber (£5). The pork yielded a good flavour, but it was a bit dry, as was the bread. The lamb was a little bland. 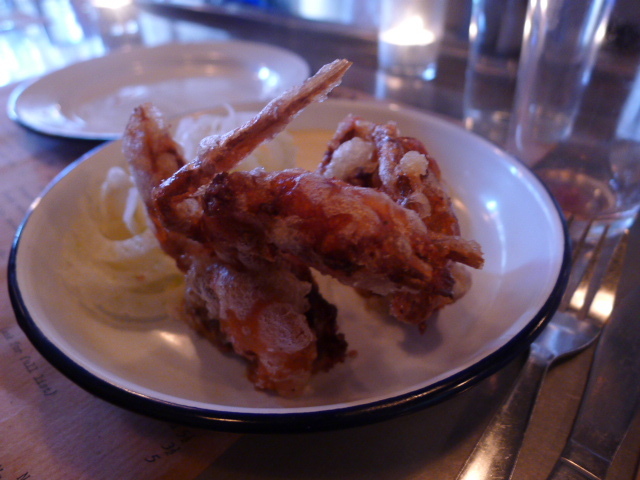 Softshell crab (£9.50) was flavoursome, meaty and crispy with a nice light coating. It was served with a well made creamy tabasco aioli. 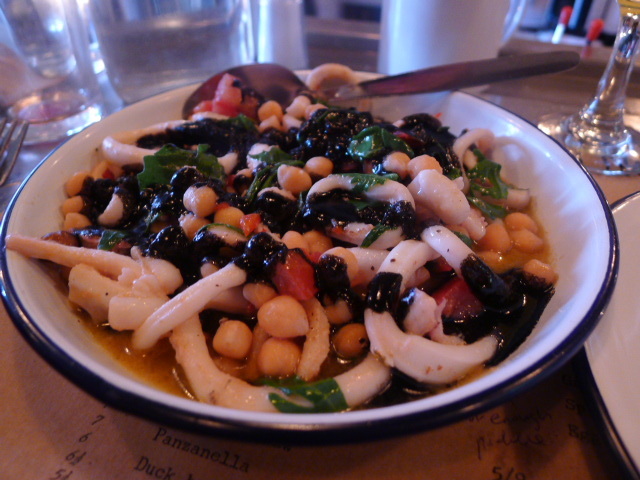 Calamari (£8) with chick peas and squid ink was tender and well cooked. The chick peas were a nice match for the calamari, but the squid ink sauce was a little runny. It needed greater reduction for a more intense flavour, and for this reason the dish didn’t quite hold up. At Polpo, the orange and almond cake held me spellbound, and at Polpetto the flourless chocolate cake was to die for. These people know how to bake cake, and these examples were enough to convince JK that we should go for the cake on the menu as our dessert, whichever flavour it might be. 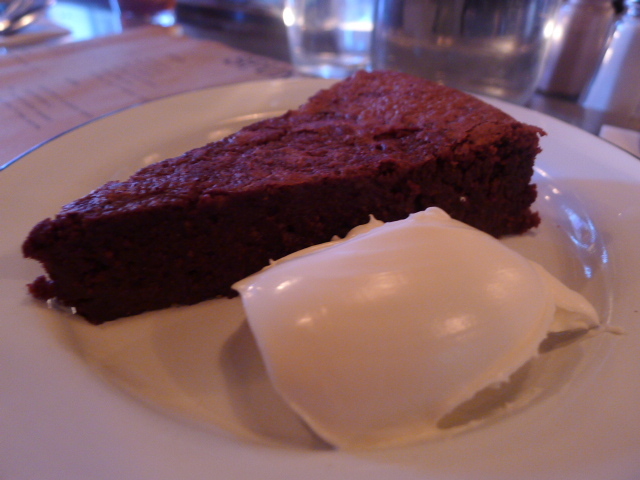 On this occasion it was chocolate, pecan and whisky cake (£6), and it did not disappoint. The cake was superbly moist, nutty and chocolately. This cake was homemade and showed off tremendous skill. The service was mightily pleasant, but as you sit at the bar, it was only bar service rather than a full table service. The food is respectable but unspectactular. I wasn’t enthralled enough by the flavours to want to order more like I did when I went to Barrafina. There I was overwhelmed by the desire to keep on eating as the food was so good. But where it falls slightly short in the food stakes, it makes up for in ‘cool’. And it does do amazing cakes which are well worth ordering every time, whether you are at Polpo, Polpetto or Spuntino. Price: About £40 per head. Excludes drinks and service. Is it a tapas restaurant if it isn’t Spanish…? Good point. It’s more ‘tapas style’ eating. Three lunches in one day is awesome. You’re my kind of foodie. Looks worth it for the chocolate, pecan and whisky cake alone – I want that recipe! I wouldn’t mind getting my hands on that recipe as well!